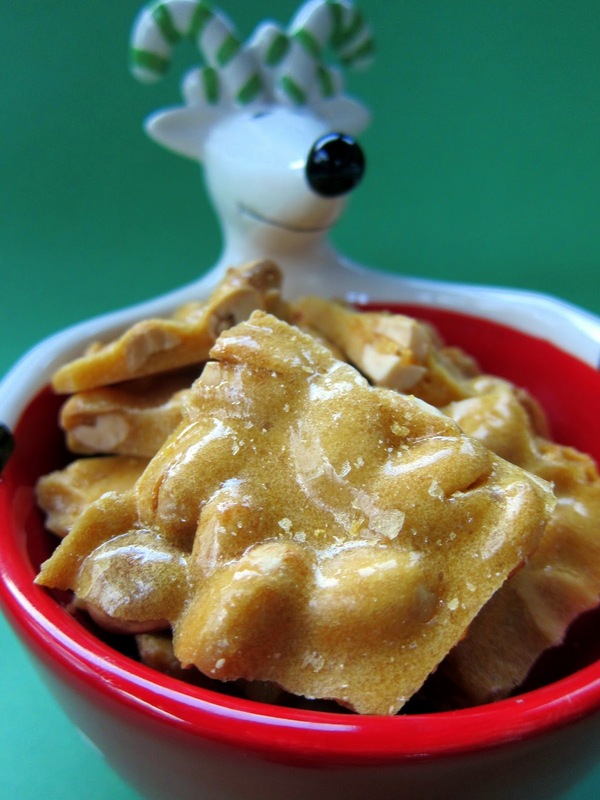 Microwave Peanut Brittle - no candy thermometer required! This is my Mom's recipe for peanut brittle. It is really easy and doesn't require a candy thermometer! You make this brittle in the microwave! 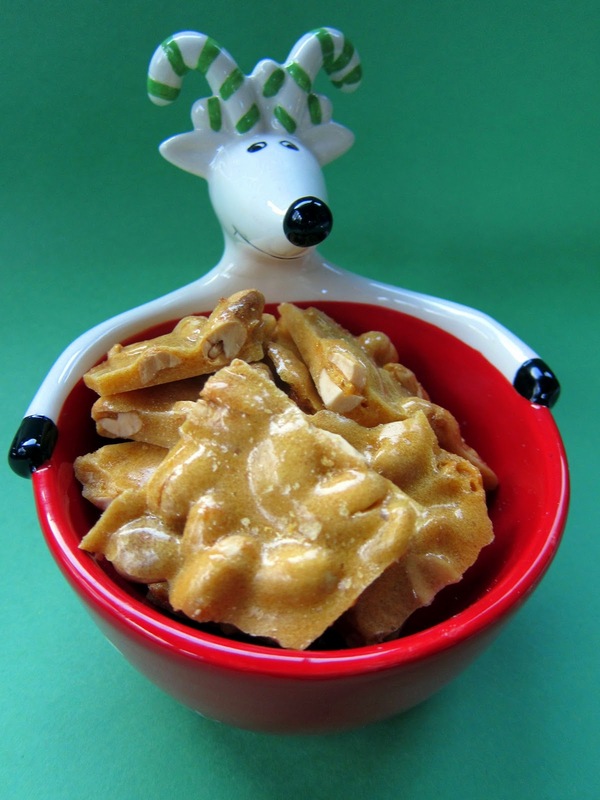 I make this peanut brittle every year for Christmas, and everyone loves it. No one would ever know it was made in the microwave! You will have to play with the cooking times and adjust them to your microwave. It is also a good idea to have everything measured out before you start so the sugar doesn't harden prematurely. Combine sugar and syrup in a microwave safe bowl (I use a glass bowl), stir. Microwave on high for 5 minutes. Add butter, vanilla and peanuts; stir. Microwave on high for 1 minute 30 seconds. Remove bowl from microwave and quickly stir in baking soda. Immediately pour mixture onto parchment paper, aluminum foil or a Silpat. Spread into a rectangle and let cool for 1 hour. Break into pieces and enjoy! Looks very good Steph - I really like the homemade version. I'm going to have to try this one, cause the last recipe I used wasn't that good. Oh I have to make this! Thanks! Steph! It so code outsyde it make MY peanut brittle ! I have this same recipe and have used it for years...never has it failed me. Stephanie, I had a microwave peanut brittle recipe years ago that seems to have gotten lost. I was getting ready to Google for one, but afraid to trust just any ol version. Thanks so much for posting this. That easy???? I can't wait to make me a batch, I LOVE peanut brittle. so, i just tried out this recipe!!! it is SO tasty and SO easy. i had some problems getting the concoction to spread out to cool, but i just plopped it onto some parchment paper, waited an hour, and then took my meat beater to it! great way to get out some aggression too ;)! will DEF be doing this again :) thank you for such a great blog! <3 from wyoming! My family loves peanut butter and this recipe is so much easier than mine. Thanks for sharing. Mine burnt to a crisp. I'm not sure what I did wrong. I found this recipe on pinterest and I am so excited to try it! I have featured this project on my Pinterest Picks post. http://www.thecraftyblogstalker.com/2012/09/pinterest-picks_15.html I would love for you to stop by and grab a feature button. If for any reason you want me to remove your feature please let me know. Thanks for sharing! I found this recipe on pinterest. I made this (2 batches)as a gift for our Thanksgiving host-and they loved it. I am now going to make 2 more batches for a Christmas party and a gift for one of my neighbors. I love this recipe-easy to make and tastes great! Lyn - I'm so glad the recipe worked out for you. I love how easy and delicious this is too. Just made this, so simple and easy and delicious ! Thanks so much for sharing. Merry Christmas to all. I think Gina's microwave runs hotter and burned hers. I have one that will do that, and one that won't. You have to really experiment with the hotter ones. This recipe is AWESOME!! Made four batches this morning and it is delicious. It's so easy and works every time! Thanks! Anyone have a tip on cleaning the bowl after? And can you double the recipe? Does that change the cook time? We made the first batch just now but need to make 3 more and that sugar-encrusted bowl is laughing at us. Awn - just run it under hot water for a minute and the sugar will come off. You can let it soak and you can scrape the sugar off the bowl. I've never doubled the recipe. I don't have a bowl big enough to do that. Does anyone know how long the brittle lasts for before going stale/bad? I want to make it a little ahead of time as xmas gifts and I want to make sure it'll still taste good by the time it reaches the hands of its recipients! J Bear - it will keep a few weeks. I make it and mail it. It is always good when it arrives. I can't wait to make this!! I just read the last comment, too, and am going to send some to my brother who lives far away. Thanks for sharing!! Just made this and it turned out great but it didnt get a brown color. It looks more like butter. I did one batch with white sugar, and one with brown. I let it sit for an hour + and its still soft. But delicous. I'm also wondering why mine came out white and not brown like pictured above? Chelsea - It sounds like you need to cook the sugar longer in the microwave. It should turn a light brown color as it cooks. I made this last week and it turned out perfectly. Today I made a double recipe and the only thing I did differently was I forgot to double the butter. This time it has sat for over an hour and is just all sticky. It is completely cooled, but it won't harden. What do you think I did wrong? Maybe this recipe just doesn't double well? cassy88 - you can use whatever nut you wish. I've never made this with dark syrup. I think the dark syrup should be fine, the brittle will probably be really dark though. It might not look appetizing. I used my pyrex measuring cup to cook this in but please be aware that it bubble over. Not large enough. Next time I will definitely use a larger bowl. Other than that, it turned out great. Thanks for a fast and easy recipe. So I made this recipe for Christmas and I did exactly what the recipe said. It ended up melting together in my dish so I heated it up and spread it back out and put it in the fridge for 24 hrs just to be sure. Unfortunately they melted together again.. any suggestions on what I did wrong and how to fix it?! Sounds like you probably needed to cook it longer in the microwave. You might need to increase the initial cook time to 5 1/2 minutes. All microwaves are different, so you have to play with the time. It should start turning a light amber color after the first cooking time.